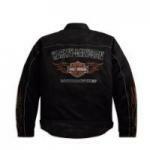 Harley Davidson Jackets come in many different styles and materials. 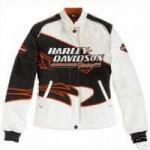 As a Harley rider, you’re fortunate to have several excellent choices when deciding on a jacket. The downside, of course, is wading through all the options to find the right choice. The most important choice is probably whether to go with leather or a synthetic material. There are pros and cons to both, but in the end it’s probably a matter of personal choice. If you’re looking for a classic Harley Leather Jacket, no amount of discussion will convince you to choose a synthetic. Humor me for a moment, though, and allow me to discuss the various options available. When it comes to good looks, leather can’t be beat. It’s luxurious feel and silky exterior are unmatched and never go out of style. There are several different models of Harley leather jackets but, in general, leather offers fewer options for color and design than synthetic jackets. Another possible drawback: leather can be very hot. The thickness of the leather presents a tradeoff — heavier leather offers better protection but can be unbearably hot in the summer. Some jackets offer perforated leather to offset this issue, but it’s not a perfect substitute for the flexibility offered by synthetics. Heavier leather also takes longer to “break in” and can feel stiff at first. A quick note about leather measurements: leather measuring less than 1.0mm in thickness is considered lightweight, while leather thicker than 1.5mm is quite heavy. If you’re looking for timeless styling, synthetic jackets will probably never rival leather. But a synthetic can be quite stylish in its own right, and can offer quite a bit more in terms of functionality. Synthetic jackets come in a variety of materials. One of the most popular is Cordura, an abrasion-resistant material that is often used in backpacks and luggage. Cordura jackets are often treated so that they are both waterproof and breathable, a la Gore-Tex. They also often feature built-in body armor in the elbows, shoulders and/or spine. And finally, since these materials can easily be dyed, they are typically available in a wide variety of color options. And finally, synthetic jackets are often highly-configurable — some have vents that open up to provide more airflow, or removable inner liners for extra warmth. Of course, some jackets just don’t really fit into the above categorization. Denim, for example, offers a unique proposition: a certain classic style that is appealing to many, while cooler in the summer than leather. Nylon offers flexibility and some of the weatherproofing options of a synthetic but, depending on your point of view, may not offer the great looks of leather. A quick note about women’s jackets… Motorcycle fashion has evolved over the years, to the point now where you can find fashionable options that are specifically designed for women. Many of the synthetic jackets are designed to be unisex, but there are at least a few options available that are specifically for women. Opting for a leather jackets opens up a wide range of choices for tailored, stylish women’s jackets. 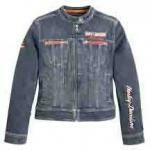 This superbly tailored denim women's jacket, new from the manufacturers of Harley Davidson clothing wear, is sporty and stylish. Two zippered chest pockets, as well as two pockets at the side for warming the wearer's hands, provides plenty of space for securing items and accessories during longer rides. 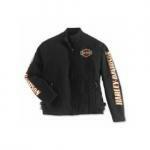 The Harley Davidson Women's Charisma Leather Jacket is a stylish addition to any female rider's wardrobe. It's made especially to coordinate with the Charisma Leather Chaps, but it also looks great by itself. This vintage-style Harley Davidson Women's Jacket offers the look of Harley Davidson from yesteryear with contemporary materials and craftsmanship. 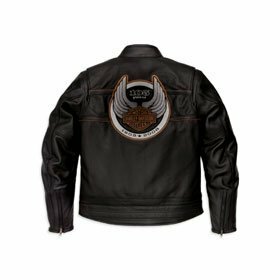 The women's Screamin' Eagle twill jacket allows every woman to display her love of Harley-Davidson with a striking piece of wearable art. This ladies-cut jacket features the world renowned Harley-Davidson Eagle on a field of white cotton twill, wrapping around back and front. Looking for a Harley jacket but don't want leather? 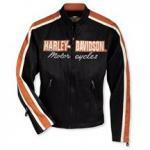 This nylon jacket exudes Harley cool, is stylish and functional too. It features a mandarin collar that won't get in the way, a durable main zipper, as well as zippered hand-warmer pockets.